All of us love traveling, don’t we? We are all aware that a travel or journey doesn’t happen by fluke. It needs to have a purpose and a great deal of planning to make it successful. A traveler depends upon a lot of information at various points of his journey cycle to enjoy the travel experience. These points of the journey cycle would include ‘before’, ‘during’ and ‘after’ aspects. A traveler would term a journey a pleasant experience if all the aspects add up as positive experience. 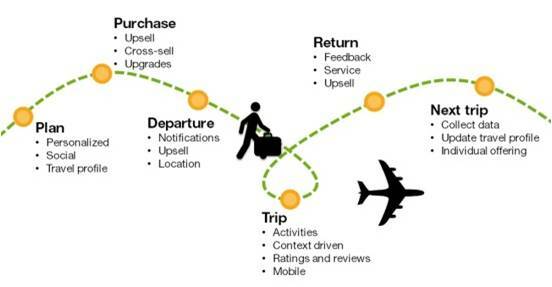 How do the travel agency (Business) provide the relevant information at the right points of the journey cycle that can improve the traveler(customer) experience? The contextual and real time communication between the traveler and travel agency is pivotal to create a pleasant experience for the traveler as well as a means to grow for the travel agency. In an effort to make that crucial communication easier for businesses and their customers, Glad Minds’ Customer Experience Software provides a two way connect and communications platform. The businesses are thereby enabled, to be in constant touch with customers for better services.